I’m super excited that I’m half way done. EEEEE!!!!!!! It has been super hot this past week so I’ve been guzzling water ALL THE TIME. I’m averaging around 100+ ounces a day. On Friday I reached a gallon. It’s all so weird to me but I def feel off when I fall behind, which typically is the weekends since I don’t have a water bottle in my face like I do at work. Speaking of H2O, I’ve been starting to get up 1x in the middle of the night. Not only is this super annoying but I’m also super afraid of walking up the dog, who would also like a pee break then. I’m starting to feel slower on the hot days. It’s frustrating to me. I can still do distance on our long walks (like 4 miles), but slower on the hot days. Maybe everyone feels that way around 90 degrees but I’m really paying attention to things now so I’m noticing it. Just set up our registry on Baby Lists. I love it. It’s fun looking all around at different sites like amazon, babies r us, etsy, etc and basically pinning things to 1 central registry. Oh, and don’t get me started on the nursery! Glued to Etsy and Pinterest finding things to ultimately buy or DIY. Also, just ordered some samples & some yards of fabric from Spoonflower to test things out for some sewing projects. Super excited! Weight Gain: Heading to another Dr appointment on Wednesday. We’ll see how it goes. 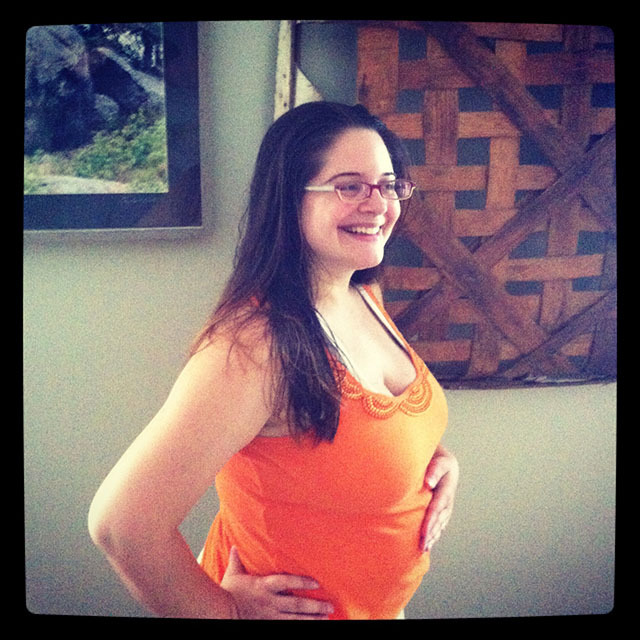 Clothing: No maternity wear yet- still really happy about that. Cravings/Aversions: I’ve wanted some junky stuff this past week. Resisted buying a 2lb jar of jelly beans but caved one day and ate a side of onion rings for lunch one day- which I ultimately regretted. Gross. Feel like watermelon for dinner tonight, we’ll see. Sleep: Fine, lots. Annoying that I’m starting to get up in the middle of the night. What I miss: wine, cold beers- what else is new? WHAT C-Section?!?!?! NO WAY!!! WHY??? If you want some great Dula or Dr. Rec’s let me know! All 3 of mine were born in Boston all natural not even an IV, best experience in the world 🙂 Maybe we can get together this summer? We will be at the Cape July 30- Aug 12!! congrats on your midway mark! !